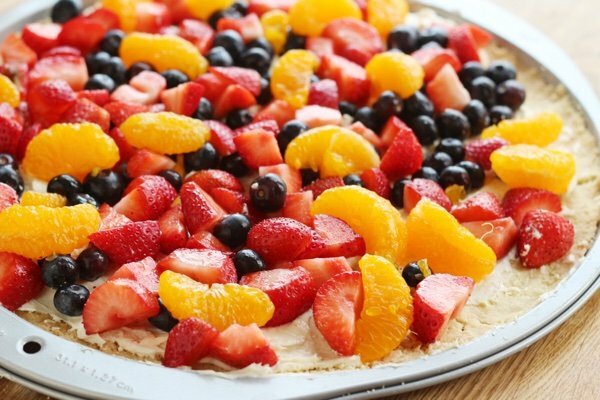 This fruit pizza recipe is a kick. You get to say “pizza” when you are actually serving dessert. I have a pizza problem which I have tackled by not eating pizza unless it is absolutely the most delicious pizza in the world. No cold, gummy crust, ketchup like sauce, bland or too salty pizza for me. Fortunately, my standards rule out most pizza. But, what about fruit pizza? 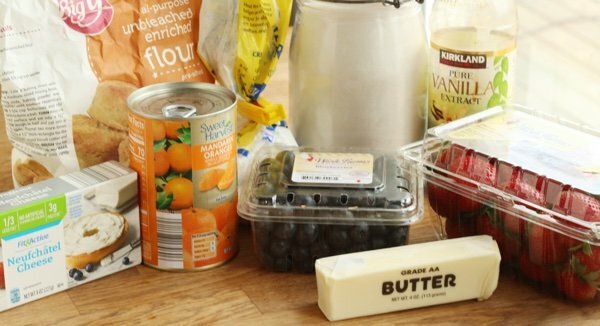 I love this recipe because it features fruit and it is fun to make. It is not the healthiest choice but you could do much worst (cheesecake I am looking at you). For a super light dessert check out my healthy strawberry shortcake or my stuffed strawberries. There isn’t a lot of added sugar per serving (about 2 grams). Most of the sugar here is from the fruit. But, there is butter so that makes this high in fat. Every once in a while – I think a little butter is a good thing. The butter is for the crust which is like a shortbread cookie. You press the crumbly mixture into a pizza pan and bake it for ten minutes. That is all you have to cook! The rest is simply washing and cutting up fruit and making a creamy base for the fruit to sit on. 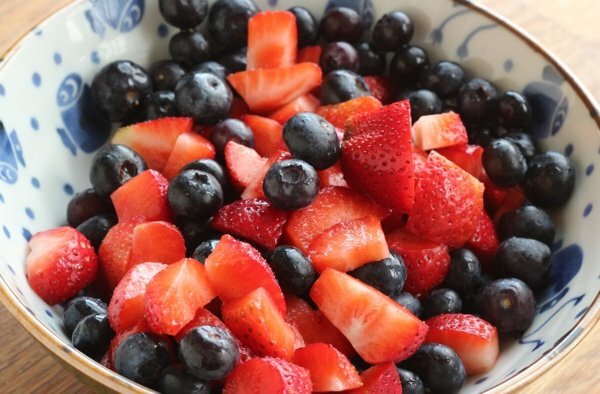 I used blueberries, strawberries, and mandarin oranges – but I wish I had added kiwi for a splash of green as well. 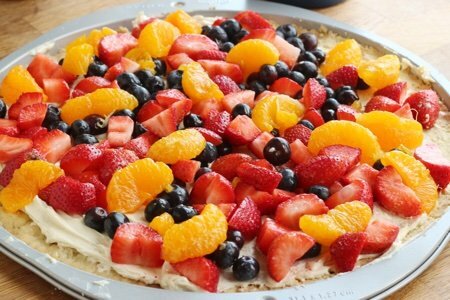 Add your favorite fruit – it doesn’t matter because it all works on fruit pizza. Take this to your Easter gathering for a nice splash of color and don’t tell anyone how easy it was to make. Definitely do not mention all the antioxidants in blueberries. I just tossed the fruit on there but I bet more creative souls could make a beautiful pattern with sliced strawberries. That would take time (of course) so I didn’t do it. 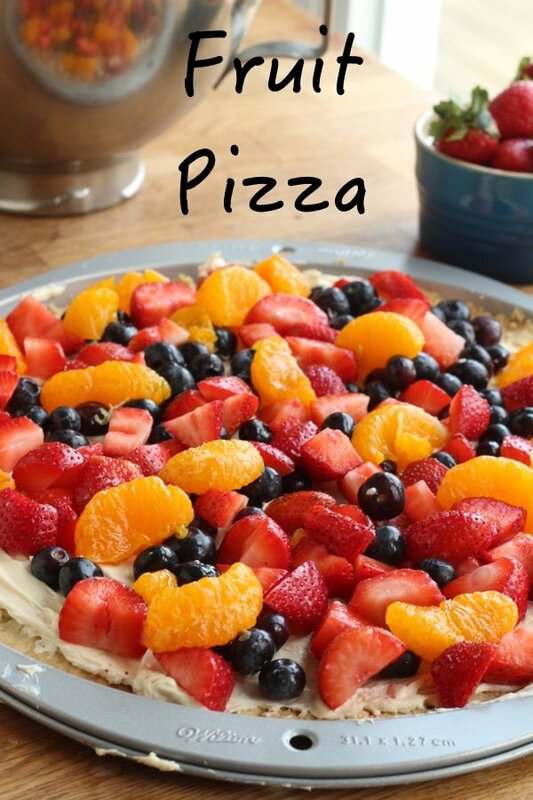 Do you make fruit pizza? What do you put on it? Heat oven to 350. 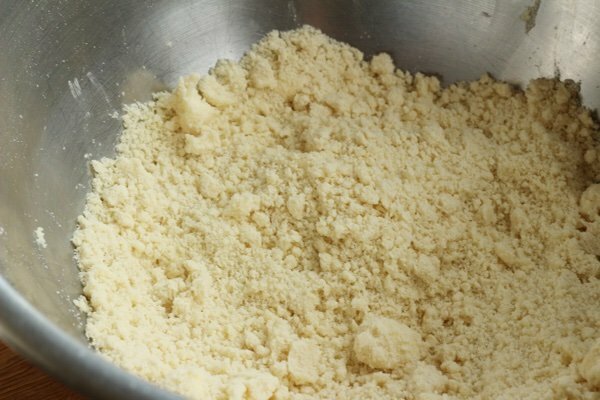 In a large bowl, mix flour, confectioner’s sugar, and butter until crumbly. Press into a 12-inch diameter pizza pan. Bake for 10-12 minutes until golden brown. Cool on a wire rack. In a medium bowl, beat cream cheese, sugar, and vanilla. When “crust” is still slightly warm, spread the cream cheese mixture on top. Add the fruit and chill for an hour so it will firm up. Omg...As a kid well over 30 years ago, my mom would make this for us all the time!! My daughter's birthday falls on Easter this year. THIS will be her April Fool's day surprise (no cake, but a fruit pizza)! She will actually love this better anyway...Thanks for the recipe/post. I'm excited to share this with my kiddos just like my mom shared it with me! I actually make a cheesecake using a box of sugar free cheesecake mix with two cups of nonfat greek yogurt and top it with no sugar added cherry pie filling. Its yummy! I don't even have to add any sweetness to it and have all my co-workers making individual servings for their snacks.